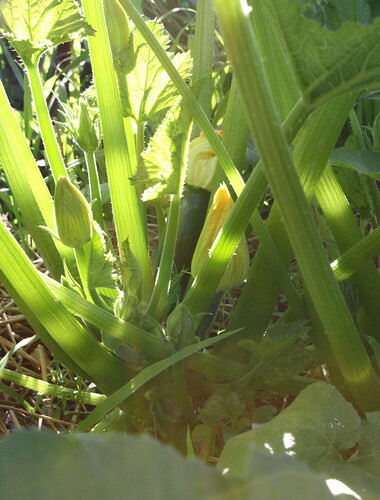 Having been around the block a time or two, I only planted one hill of zucchini, and on that hill only two plants germinated. Surely, not enough to overwhelm us, right? 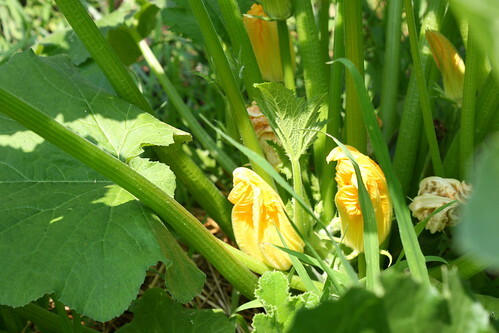 There are several zukes ripening even now, as I speak, and many more blossoms currently blooming and in development. As I look into the rather lovely foliage every day to check on the progress of its fruit, I always hear the theme from “Jaws” in the back of my mind. I know the kind of chaos zucchini plants can wreak! But as the evening sun shines through its translucent, glowing stems, I can forgive all these sins and simply appreciate its beauty.